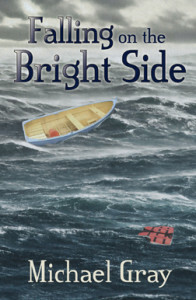 Larry Whitton is balancing on the edge of his crumbling life. Frustrated with his job at Rio Grande Manor Care, the Albuquerque nursing home where he hates his boss and resents his position as activities coordinator, he fails to see the living, even humorous, life streaming around him. Never far from his consciousness are ghosts of memories and semi-memories that jeopardize his work, his marriage, and his capacity to be the father he wants be. He is haunted by circumstances surrounding the death of his younger brother, Timmy, who, when not much older than his own son Danny is now, drowned in the dark waters of a cold lake in northern Quebec. Soon after that, Larry’s father left the family, and Larry was abandoned also by his mother who drowned any love left for her surviving son in a bottle. He carries around more than his unresolved childhood traumas. A more recent incident prevents him from trusting himself to work as a therapist, the profession for which he was trained. In the final days of his studies, a fellow student visited his room late at night, seeking support, which Larry felt unable to offer. The young man was found hanging from a rafter the next morning. Larry watches helplessly as the promotion he hoped for at the nursing home, and for which he is degreed and qualified, is snatched away from him by his boss Rita Simpson, who brings in another person for the position Larry has long sought, stranding him in the poorly paid and unappreciated job of activities director. When his wife, Julie, urges him to call Sammy, a fellow MSW student now settled in a successful Albuquerque counseling practice, Larry forces himself to make the call. To his amazement Sammy calls the very next day with a job offer. A counselor in his practice has “cashed in his chips,” Sammy explains, and urges Larry to come in to the group-practice offices to see clients that very afternoon. Larry agrees, but feels uneasy about the situation, uncertain about his own abilities, and afraid to leave his job at the nursing home without a safety net. One of these clients, Philip Cook, arrives for a session that causes further confusion for Larry. Philip talks about time, introducing a perspective that runs through the novel like a leitmotif, and sitting together in silence, because he has no idea what to say to Philip, Larry feels a wave of open possibility wash through him. Then Philip ends their session with a bombshell, stating that that evening he would be going to University Hospital to visit Dr. Bill Foster—who Larry assumed had died!—and asks Larry to meet him there. Over a period of days spent trying to divide his time between his job at the nursing home, becoming acquainted with Bill’s clients using Sammy’s office space, and seeing Bill Foster in intensive care, Larry learns that a left-hemisphere stroke has robbed Bill of the ability to continue working as a counselor. Only one person is able to understand and communicate with him: the mysterious Philip Cook. Philip guides Bill as he fights his way upward from a sea of darkness into light and consciousness, and he translates Bill’s garbled utterances, providing a bridge that connects Larry with an experienced supervisor who in turn guides Larry in his foray into counseling. Living alone that summer, Larry’s skepticism—that Philip can understand Bill’s incoherent mutterings—gradually dissolves as he, himself, learns to listen more deeply to Bill’s slurred speech. Philip’s way of listening to Bill (“. . .by matching my own flow to a larger flow that energizes my attention . . .”) helps Larry open to the unbounded possibilities of time and awareness, and he finds himself entering into other areas of his life in new and more fulfilling ways. His work with therapy clients and nursing home residents, his long-distance communication with his wife and son, and eventually the possibility of reconnecting with his father all enter a new and more hopeful phase. This is a novel about disability and how the loss of one faculty can feed a greater wholeness. In this healing wholeness, resentment of the past gives way to a readiness to understand and to reconcile. Allies show up to help Larry meet the challenges which seem to pop up with every new possibility: Hildie, his new boss at the nursing home, teaches him that this last stop for residents is an opportunity to help them; Dennis, who is afflicted with a debilitating form of MS, teaches him to live every moment fully; Father Cook, Philip’s brother and Dennis’s roommate at Rio Grande Manor, links two working environments that are competing for Larry’s time, energy, and heart. But something will have to give if Julie and Danny are to return, ready to give their family another chance. In the course of the summer, Bill recovers enough to return to his home and, with Larry’s assistance and some help from LiteWriter text-to-speech equipment, is able to participate in sessions with his oldest patients. Translator Philip gradually instills in Larry an awareness of the possibilities that can open for him whenever he doesn’t run into the arms of old fears and resentments. In Larry’s moment of impressive accomplishment—a small but promising counseling practice, a promotion to the long-sought job at RGM after Hildie leaves to look after her brother, and the return home of Julie and Danny—Larry is so overwhelmed that he makes a series of horrible decisions. He throws Bill overboard in order to return to full-time work at RGM and have time with his family, but then abruptly quits RGM in disgust when Rita makes him fire Carmen, the most giving of the caregiving staff there. To his horror when he returns to tell Bill that he now is ready to work full time to build their joint practice, it is too late. Bill will be returning to Chicago to be with his ex-wife, his daughter, and his granddaughter. So now, instead of two jobs, Larry is home unemployed, and Julie is devastated because he didn’t consult her before making these important decisions. All he has gained seems suddenly to be washing away. This will be Larry’s final fall from grace, at least within the narrative arc of this story. In the dark night of the soul that follows, and with Danny’s insistent urging that he wants to meet his grandfather, a new contact is made between Frank and Larry Whitton. After fourteen years of silence, Larry drives to Toronto and brings his father back to Albuquerque, rescuing him from a dingy old-age home where he has lived for years. On their long drive back Larry finds he is still unable to release the old bitterness which is based on a fundamental misunderstanding that keeps rising to the surface, like the bloated body of his brother which he was not allowed to see. He has never known why his father left their home and why, after that, saw Larry only on his birthday and then, around the time of his high school graduation disappeared entirely. He has blamed his father for the death of his brother and then abandoning him. How could a father let his small son drown while paddling across a small lake? Now he hears about the day that Timmy drowned, and he learns that his father was court-ordered to see Larry only once a year after a judge found him negligent in Timmy’s drowning death (Larry’s mother had a good lawyer). He also discovers the reason that his father dropped out of his life completely: A near fatal accident on his way to Larry’s high school graduation prevented him from inviting Larry to live with him, once Larry turned eighteen and the punitive court order would have been lifted. It has taken Frank, who has a plate in his skull, years to recover the cognitive capacity that finally allowed him to make contact with Larry, and years to deliver the message that he would rather have died than willingly abandon his beloved son Larry.